This magnificent cathedral is a rare departure from Santa Fe’s ubiquitous Pueblo architecture. 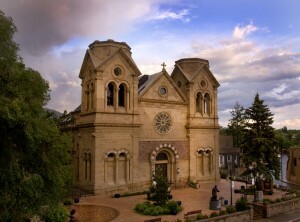 Construction was begun in 1869 by Santa Fe’s first archbishop, Jean Baptiste Lamy (the inspiration behind Willa Cather’s 1927 novel Death Comes for the Archbishop), working with French architects and Italian stonemasons. A small adobe chapel on the northeast side of the cathedral, the remnant of an earlier church, reflects the Hispanic architectural influence absent from the cathedral. The chapel’s Nuestra SeÒora de la Paz (Our Lady of Peace), also known as La Conquistadora, is the oldest Madonna statue in the United States. Just south of the cathedral, where the parking lot meets Paseo de Peralta, is the Archives of the Archdiocese Museum, a small museum where many of the area’s historic, liturgical artifacts are on view. Sun. at 6, 8, and 10 AM, noon, and 7 PM. Museum weekdays 9-4.